Beautiful handcrafted rosary made with glass cube beads. Crystal copper glass cube beads are 8mm in size. Crucifix measures 2" and St. Michael center measures .75". 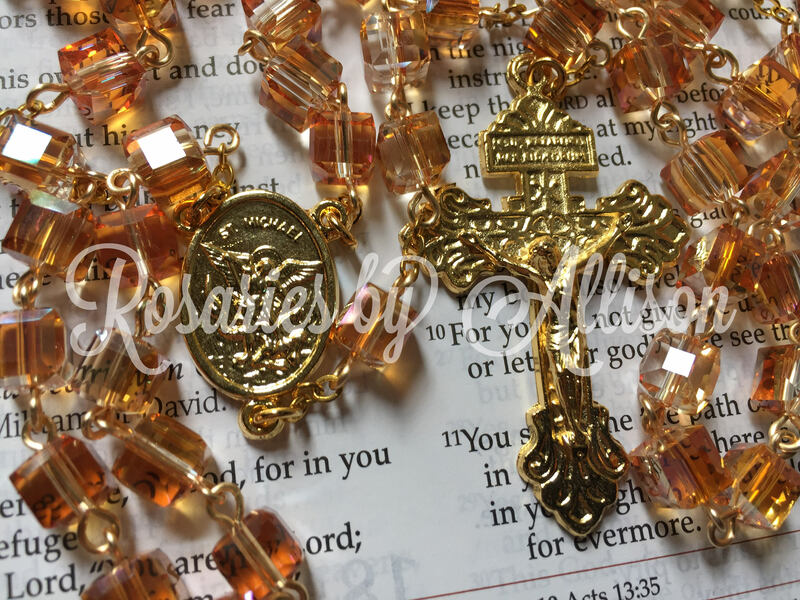 Rosary measures approximately 22" in length. As always 100% best! Love working with Allison to create my vision.. and when my rosary arrives it’s ALWAYS more beautiful than I imagined! I accept PayPal, credit cards, and Etsy gift cards. Payment must be received before I ship your goods. All custom orders require payment before I purchase any supplies. Need a custom or made to order rushed? I'll tack on an extra $10 for this. If for any reason you are unhappy with your purchase, please Convo me within 7 days upon receiving your goods. Returns cannot be made, but exchanges of equal to or greater value are accepted. If an item arrives damaged, I will repair it if possible, with the shipping cost being the responsibility of the customer. If an item is lost during shipment, I cannot offer a free replacement, however I can offer a significantly discounted replacement. Please Convo me if this should ever occur. All items ship USPS First Class, unless you Convo me BEFORE purchase. If you need something rushed, please let me know and I will send a separate PayPal invoice for the difference in shipping, such as Priority Mail or something else. - All of my rosaries and chaplets come in a drawstring velvet pouch, most likely black. A great way to store them while not being used, and a great way to gift it to a loved one. - RESERVING AN ITEM: All items will have a 48 hour hold, if requested. After the 48 hours expires, it will go back up for sale to everyone else, unless we have agreed otherwise. - All rosaries have lifetime repair, with normal prayer. Customer will be responsible for a $3 shipping charge. If any pieces go missing, customer is also responsible for replacement of lost pieces. If pieces are discontinued, we will decide on a suitable substitute together.